Green ambience: Tan displaying the development comprising 70 bungalows near Gasing Hill. 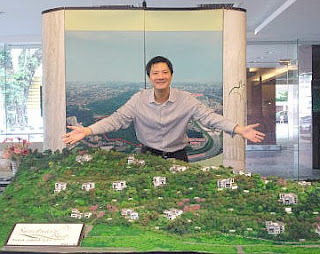 The development in Bukit Gasing, Kuala Lumpur, is being carried out on privately-owned land and not on forest reserve, said Gasing Meridien Sdn Bhd executive director Leo Tan. Tan said the development had nothing to do with the Bukit Gasing forest reserve in Petaling Jaya or Kuala Lumpur. He said there were too many inaccurate statements made by certain people. “I would like to reiterate that our land is privately-owned since the late 1970s. It is located at the southern tip of the Kuala Lumpur side and has never been for recreational or open space. “We acquired the freehold land in 1994 and have not touched anything that is gazetted as forest reserve. “We are also all out for protecting the forest reserve but our land is private. We have been having trouble communicating with the people due to inaccurate statements. “Right now we are building an access road, sewerage system and laying pipes and cables for water and electricity supply. “We also deserve a fair representation from the media because all the rules, regulations, terms and conditions pertaining to the development have been followed accordingly. “It presents a difficult situation for us when we have to explain to our buyers that the land is not on forest reserve. “We have to put in extra effort in getting the right message across to the people and showing that we have complied to all the requirements for the hillside development. Only 3% of the land is unsuitable for development. “Our development which will be completed by 2015, aims to protect most of the trees on the land,” he said. He added that people were entitled to their own opinion but it had to be based on facts. The development, Sanctuary Ridge, comprises 69 bungalows on a 15.4ha site off Jalan 2/132, south of Gasing Hill. It has been reported the residents had applied for a judicial review in the High Court in 2008 challenging the Kuala Lumpur City Hall’s (DBKL) approval for the development. The residents appealed against the decision in the Court of Appeal on March 6 without success. Kuala Lumpur mayor Tan Sri Ahmad Fuad Ismail had said even before the inception of Federal Territory of Kuala Lumpur, the land had already been zoned for housing by the Selangor town and country planning department. Fuad also said DBKL had 52.6ha of green lung to be gazetted near the area. Gasing Meridian is a member of the same development group that built Gasing Heights Condominiums in Bukit Gasing. The six high-rise towers — Fraser Towers, Maxwell Towers and Cameron Towers are well-known landmarks. PETALING JAYA: TA Global Bhd is buying the hotel and business of Movenpick Karon Beach Resort in Phuket, Thailand for US$90.2mil (RM275.6mil) cash. The property development and investment group told Bursa Malaysia that its wholly-owned subsidiary, Crystal Caliber Sdn Bhd, had entered into a sale and purchase agreement on Wednesday with Kingdom Hotel Investments regarding the Thai hotel. The four-star hotel has 175 guestrooms, 163 suites and villas and 30 beachfront two-bedroom apartments which are on a 82,828 sq m freehold site. TA Global also said the hotel had facilities including eight food and beverage outlets, four swimming pools, a spa with seven therapy rooms, a fitness centre, business centre, kids club and in excess of 1,350 sq m of meeting and banqueting space. The hotel is located about 15km from Phuket town, and is also within a 10-minute drive from Kata Beach and the Patong Beach district. TA Global will fund the purchase from internally generated funds and external borrowings. TA Global said the purchase price took into consideration comparable market evidence of earnings multiples. No valuation has been conducted on the hotel. Kingdom Hotel Investments had invested US$69.8mil (RM213.4mil) in the hotel in April 2006. Based on unaudited financial statements as at Feb 29, 2012, the hotel has net assets of US$67.6mil (RM206.6mil) and an occupancy rate of 93%. TA Global, which owns two hotels in Australia and one each in Canada, Singapore and China, said the Thai hotel deal would enhance the group's hospitality operations in major cities worldwide. “This will provide steady revenue stream and enhance the revenue contribution from the hospitality division to the group,” it added. It was also pointed out that Phuket enjoyed a high volume of international visitors and remained one of the most visited destinations in Thailand. The Phuket International Airport is expanding and by 2014, it will have an annual capacity of 12.5 million passengers which is almost twice its current capacity level of 6.5 million. The proposed purchase is expected to increase TA Global's gearing ratio from 0.32 times as at Jan 31, 2011 to 0.42 times. The deal was expected to be completed by the second quarter of the financial year ending Jan 31, 2013, the group said. Malton Bhd has proposed to dispose of its 20 per cent entire equity interest in Austin Heights Sdn Bhd (AHSB)to Southcon Builders Sdn Bhd for RM34 million. In a filing to Bursa Malaysia, Malton said the disposal would enable it to realise its shared profits in the investment in AHSB. "Furthermore, the disposal will enhance the cash flow position of the group and support the core business of property development and construction," it added. It said the proceeds from the proposed disposal would be utilised to finance the working capital requirements of Malton within 12 months from the receipt of the disposal consideration. "The disposal will not have any material impact on the net assets and net earnings per share for the financial year ending June 30, 2012. "Nevertheless, upon completion of the disposal, Malton will make an estimated gain on disposal of RM12,730,000 and RM3,927,000 at the company and group level respectively, based on the latest available unaudited financial statement of AHSB as at Dec 31, 2011," it added. The disposal is expected to be completed within the financial year ending June 2013.
iProperty Group Ltd, owner of Asia's No. 1 network of property portal website, today announced the appointment of Edward Sutton as general manager, developer for iProperty Group. In a statement, iProperty said Sutton's role would be to work with property developers across the region in providing marketing solutions via the network of market leading iProperty portals. iProperty chief executive officer Shaun Di Gregorio said Sutton was highly regarded in the property developer business across the group. "His business acumen combined with his understanding of the developer market is the perfect fit for the business. "This appointment further delivers on our strategic goal of deepening our engagement with the property developer industry," he added.